COATINGSPRO ROOF COATINGS 2018 27 SPONSORED CONTENT Roof Restoration Solutions for Rockstar Performance Your customers expect reliable and aff ordable products that are proven to perform. Provide roofi ng solutions that are eco-friendly, industry approved, energy effi cient and backed by long-term warranties and you will earn your customers' trust, referrals and respect. 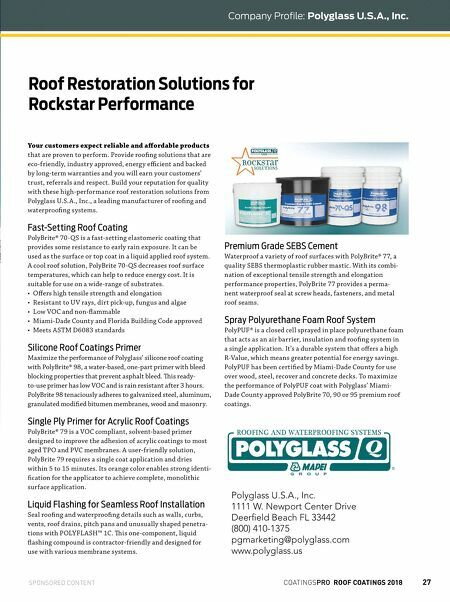 Build your reputation for quality with these high-performance roof restoration solutions from Polyglass U.S.A., Inc., a leading manufacturer of roofi ng and waterproofi ng systems. Fast-Setting Roof Coating PolyBrite® 70-QS is a fast-setting elastomeric coating that provides some resistance to early rain exposure. It can be used as the surface or top coat in a liquid applied roof system. 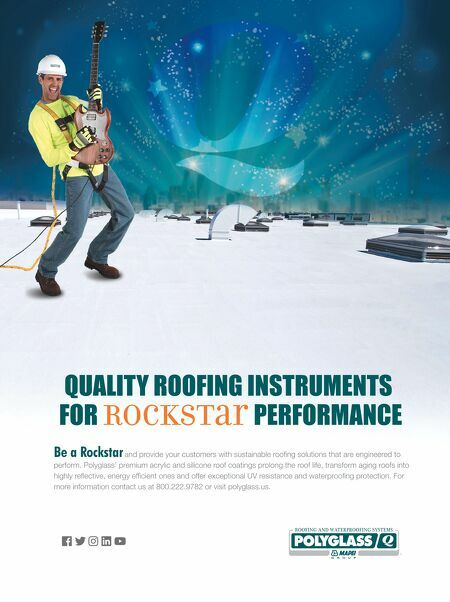 A cool roof solution, PolyBrite 70-QS decreases roof surface temperatures, which can help to reduce energy cost. It is suitable for use on a wide-range of substrates. • Off ers high tensile strength and elongation • Resistant to UV rays, dirt pick-up, fungus and algae • Low VOC and non-fl ammable • Miami-Dade County and Florida Building Code approved • Meets ASTM D6083 standards Silicone Roof Coatings Primer Maximize the performance of Polyglass' silicone roof coating with PolyBrite® 98, a water-based, one-part primer with bleed blocking properties that prevent asphalt bleed. is ready- to-use primer has low VOC and is rain resistant after 3 hours. PolyBrite 98 tenaciously adheres to galvanized steel, aluminum, granulated modifi ed bitumen membranes, wood and masonry. Single Ply Primer for Acrylic Roof Coatings PolyBrite® 79 is a VOC compliant, solvent-based primer designed to improve the adhesion of acrylic coatings to most aged TPO and PVC membranes. A user-friendly solution, PolyBrite 79 requires a single coat application and dries within 5 to 15 minutes. Its orange color enables strong identi- fi cation for the applicator to achieve complete, monolithic surface application. Liquid Flashing for Seamless Roof Installation Seal roofi ng and waterproofi ng details such as walls, curbs, vents, roof drains, pitch pans and unusually shaped penetra- tions with POLYFLASH™ 1C. is one-component, liquid fl ashing compound is contractor-friendly and designed for use with various membrane systems. Premium Grade SEBS Cement Waterproof a variety of roof surfaces with PolyBrite® 77, a quality SEBS thermoplastic rubber mastic. With its combi- nation of exceptional tensile strength and elongation performance properties, PolyBrite 77 provides a perma- nent waterproof seal at screw heads, fasteners, and metal roof seams. Spray Polyurethane Foam Roof System PolyPUF® is a closed cell sprayed in place polyurethane foam that acts as an air barrier, insulation and roofi ng system in a single application. It's a durable system that off ers a high R-Value, which means greater potential for energy savings. PolyPUF has been certifi ed by Miami-Dade County for use over wood, steel, recover and concrete decks. To maximize the performance of PolyPUF coat with Polyglass' Miami- Dade County approved PolyBrite 70, 90 or 95 premium roof coatings. Polyglass U.S.A., Inc. 1111 W. Newport Center Drive Deerfi eld Beach FL 33442 (800) 410-1375 pgmarketing@polyglass.com www.polyglass.us Company Profile: Polyglass U.S.A., Inc.